Will we always have Paris? Perhaps not, under current plans for out of scale, disruptive new developments. The famous Paris skyline is one of the city’s historic glories. Edith Piaf sang of the beauty of the Paris sky. As polls have shown, Parisians do not want towers. Nonetheless, the hunger for modernity has impelled recent mayors of Paris to enter into deals with developers to build skyscrapers. Or perhaps what moves them is the competition among cities for corporate headquarters. Or perhaps it was the urge for real estate speculation and greed. Most recently, it is the belief that corporations leaving London post-Brexit may wish to move to Paris–if only Paris offers skyscrapers. In 2008, the Paris City Council approved raising the height limits. It also approved building 12 skyscraper projects around the gates of the city. Parisians have hotly debated these towers. However, as the photos at the top of the page show, the 40-story skyscraper courthouse in the 17th arrondissement that Renzo Piano designed is already visible everywhere. A revised version of the Tour Triangle by Swiss architects Herzog & DeMeuron in the 15th arrondissement has just gone through the environmental review process called an Enquête Publique. The Duo of Jean Nouvel in the 13th arrondissement is also projected. 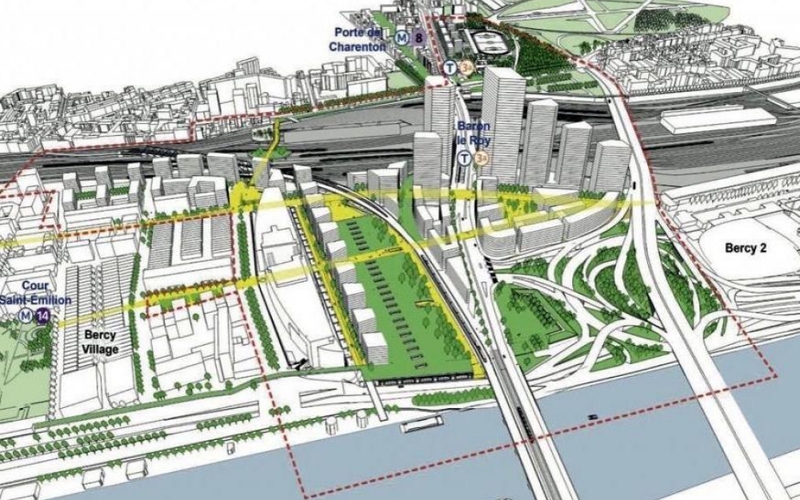 City Hall has recently announced plans for additional towers (Le Parisien article in French) in the 12th arrondissement. These, too, are hotly contested. The French preservationist association SOS Paris has joined with other associations to oppose these projects. Opponents have brought lawsuits, staged demonstrations, and published critiques. The International Coalition for the Preservation of Paris, ICPP, vigorously opposes these projects. We are working with our colleagues in the French preservationist association SOS Paris. Together we are preparing for publication a book of essays demonstrating that these projects are destructive of the city’s uniqueness. The name of our book is Paris Without Skyscrapers: The Battle to Save the Skyline of the World’s Most Beautiful City.